Sorry for the lack of posts!! I've been keeping really busy with the two jobs, bowling league and lots of summer fun. I took my first vacation day from the new job on Tuesday to spend some time with my aunts that are visiting from Colorado and Missouri. Another aunt, cousin, cousin's friend and my sister went as well. We went to the beach of course! It was a perfectly beautiful day for it too. I had a wonderful time. There's a great little food shack at this beach but of course the only option for me is basically a piece of grilled chicken sitting on a lettuce leaf, so I made sure to stock up before heading out. 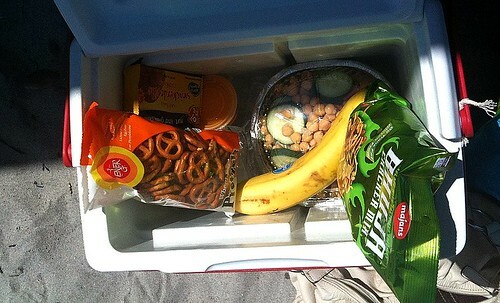 I put together a great salad, a banana, some Bhuja snacks, pretzels and snickerdoodles for dessert. It's at the point where I rarely feel deprived anymore as the rest of the family was eating fried seafood and french fries, I actually prefer to eat a salad. I'm feeling a whole lot healthier these days! I've lost most of the weight from the meds with little effort. I'd like to lose a little more but this is where the effort part comes in and I just don't care all that much about it. I'm just happy to be feeling great. I don't have a whole lot of new things to write about, my routine is pretty much just that - routine. I eat the same things all the time. Mostly fresh foods that are naturally gluten free, and I always have Udi's on hand. I do have a couple of posts up my sleeves so hopefully I'll get around to them soon! I hope you're all having a great summer!!!! The contents of this blog are based solely on personal experience. I am not a doctor, if you have health issues, please seek a professional. All artwork is copyright protected. Thanks!